But that’s a whole new story for another time, although I am sure a few of the things we talked about will find their way into this. 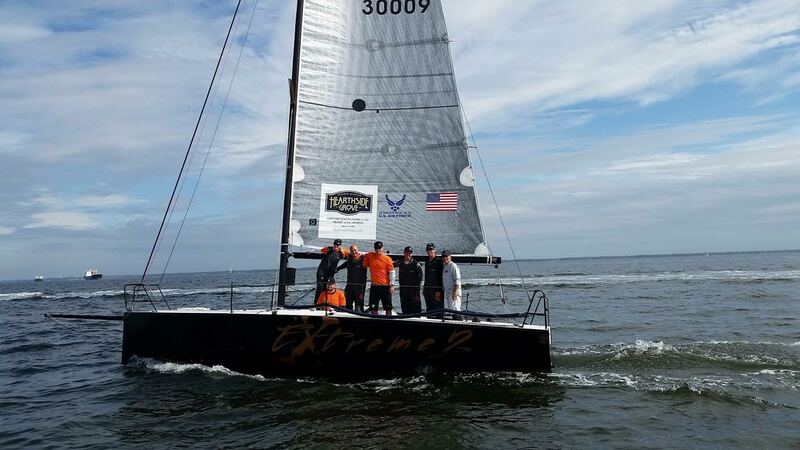 This was the 2nd C&C 30 One Design Regatta for us on the Extreme 2 and the very first time with this collection of characters. The line up consisted (from stern to sprit) Dan Cheresh, Morgan Reeser, Keiran Searle, Dave Shriner, Myself, Bryn Bachman, and Eric Vigrass. No shortage of talent or comedians here that’s for sure, for which the latter is high on our priority list. 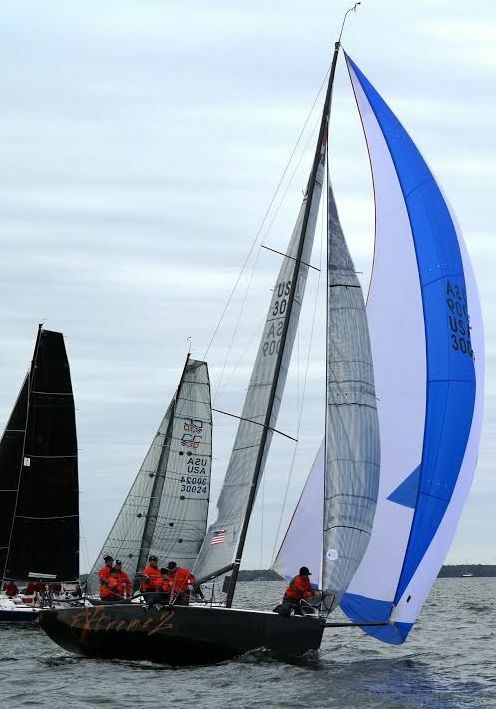 The East Coast sailors sure do like their long distance races. 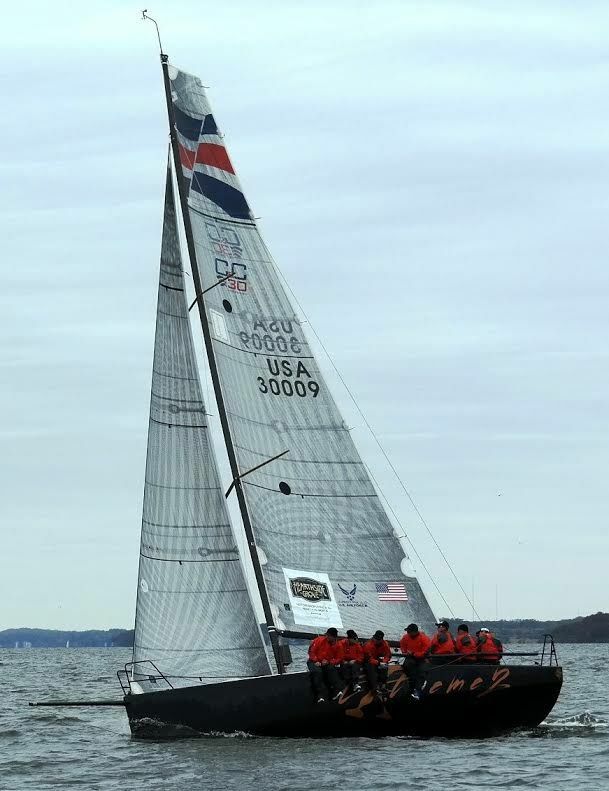 I’ve sailed more in this OD fleet than I have in like, forever, and we are only on regatta 2! Friday’s forecast looked ok, at least the sun was out and there was a nice building breeze. Jim Maddens Stark Raving Mad jumped off the line and took the early lead but it was a long race and there was plenty of time to make some moves. The second leg was the longest beat ever, with lots of separation and lead changes. By the top, we had positioned ourselves well enough to round in first just ahead of SRM and Themis. And that’s pretty much how it ended up 15 miles later anyway. Clay Deutsch’s Just a Friend team hosted a cocktail party and booze cruise immediately afterward, and that’s where I think it all started and perhaps ended for me, probably was the “I’ll take a mudslide roadie” bit that turned the tide for me. I remember waking up on the couch in the morning looking for my phone, then saw it in the middle of the living room floor. All good, no problem! Enter Morgan, with an ear-to-ear grin walking towards me with his phone. He then proceeded to show, me, the rest of the team, people on the dock and just about anybody else he could find the video of me peacefully sleeping, legs crossed without a care in the world. Apparently I snore like a wild boar after mudslides and a late night bacon feeding. Whatevs I was very well rested, and its all fair game because I know I have multiple videos of Morgan in the vault. Day 2 was again seasonal, but still no rain. Could I have possibly gotten it wrong about this place? Were we all to harsh over the years? Scott Nixon even told Morgan he wanted an official apology letter to all the Annapolitans and that it was “always like this here” and we were all way off base. Morgan refrained to comment. The breeze was little lighter today, we had our pre race chat as we motored, and motored, and motored out to the racecourse. It was a haul that we didn’t expect and its not like we left the dock late yet we made it just in time to check our set up and check the breeze. We took control early and lead pin to pin but barely held off a late charge by the SRM, it was close enough that we had to go and ask the RC who got it. Nice tight racing. Race 2 started and we were in a good spot but let most of the fleet get right of us and before we could do anything about it a huge right shift came in and they were launched. I think we rounded in about 7th and just kept clawing away. At the end we slid into the 3rd spot behind SRM with Themis getting the win. Race 3 we headed left, while one by one the rest of the boats went hard right. We were still winding up in a rightie on the far left thinking it was going to end badly. But we had breeze the whole way and it kept lifting us on port when it would come in. We crossed everyone by a mile and extended to another bullet on the final race of the day. We headed back to our crew house to find out that it had totally been cleaned. It seems the Just a Friend team was hosting a fleet party in their crew house adjacent to ours. Well, the caterers made a slight error on the address and started setting up in or house, and cleaning for about 45 minutes before they figured out the party was actually on the other side of the driveway. Party next door, and our house got cleaned? That’s a win-win in my book and a perfect way to end a good day of racing. Sunday morning arrived and it was all too familiar, the sun and moderate temps had given way to the rain and cold some of us were accustomed to. The radar looked pretty green so we were all putting on the layers and waiting to see what the day would bring. It was a lumpy cold wet ride out but when we got all the way out to the course it started to flatten out slightly. Racing again started on time, Hooligan made it to the course, and we were ready to finish this regatta. The current was pushing us over the line so our main goal was to not be over. Well, that was the plan anyway. We set up to win the pin but Themis hooked us and pushed us up and over. OCS, not what we wanted at all, as we gybed around the pin end and started ducking starboard tackers I looked back too see Themis and SRM both going back too. Catastrophe was avoided with the 2nd and 3rd place boats in the same predicament as us. SRM tacked immediately to starboard and headed left with the rest of the fleet, while Themis followed us out to the right. We went back on the first big starboard shift, while Themis kept going, it came right and they were ahead with a boat between us. It stayed that way till the 2nd windward pin when we sailed into second and closed the gap significantly.